Mortal Parent- The late Phillip Leighton, a trauma surgeon with a huge heart but also a man who's not entirely sure of what's best for his daughters. Appearance- Although Rina and Dot are fraternal twins, they still look uncannily alike. However, that does not mean they look completely like each other. There is a number of significant differences to note about their appearances - not to mention personalities, but we'll get to that later. Rina's height is approximately 5'6", if not slightly shorter. Lithe, slender body having more noticeable, appealing curves (curves that just scream sassy) than her sister's and unsurprisingly lacking in scars, her skin a bit on the paler side but her complexion is still ruddy and healthy. Her straight honey blonde hair ends halfway down her back and is often held up in a high spiky bun. One of the twins' most prominent differences is their eye colours. Rina has clear and warm, thoughtful blue eyes which are, honestly, much more friendly than her sister's. Personality- Rina has always been the flighty, all feminine one of the pair. Her role was - how should I say it? The damsel in distress. She would constantly be getting herself in trouble, but no worries, her sister would always be there for her. Dot would always come to the rescue, Rina had no doubts about that. Dot was dependable and solid, the polar opposite of Rina, who was irresponsible and slightly bratty at times. But, it was okay. Rina and Dot were two parts of a whole, they came in a package. You couldn't know one without knowing the other, they seemed to have an entire language for themselves, when in reality they just had the connection that the best of friends dreamed of having. She cares a great amount about frivolous things like fashion and cute boys, so she is obviously dubbed a "girly girl," which is totally fine with her. While she is more than a little air-headed and reckless, Rina's heart beats true and she feels genuine empathy for others - never sympathy. She will not hesitate to offer a shoulder to cry on, a hand to hold, two arms to surround you with. She's always cracking jokes to lighten people's moods, and for the most part, it works. Her friendliness is one of the things that makes her much easier to approach than her twin. Unlike Dot, Rina spares her love freely and she will not hesitate to make new buddies and pals. Her complete trust of anybody and everybody, and some would say her naivety, is one of the many ways of defeating her. Of course, like all females, Rina has certain moods where she storms around and hates everything. It's all a part of the process and one of the down-sides of being a girl, so there is no need to be alarmed when the sweet, teasing Rina is replaced by an angry, bipolar whirlwind of death. She will not be taken advantage of, and she will not hesitate to teach a lesson to someone who does her wrong. "Actions all have consequences. The little punk should have thought things through before he tries to lay a hand on me." She said after one particular case of advantage-taking. Needless the say, the foolish boy never underestimated a girl again - fearing the nonexistence of his future children. Rina is also capable of being thoughtless at times and uncommitted, she'll do what is convenient rather than what is necessary - something that earns her many disappointed looks in her direction. She lacks faith in herself and she finds it hard to be focused on one thing at once, often getting distracted and not finishing anything in just one sitting. Close-minded and intolerant even though she herself can be quite intolerable at times, Rina looks past her own faults and focuses on others', laying the blame on people other than herself and often escaping trouble because someone else was punished in her place. Don't forget immature and indulgent, she does what she wants and nobody can stop her, not even Dot. History-Rina has always been a beam of sunshine in the otherwise cloudy grey sky, constantly cheering up others and ensuring that everything would be fine. She seemed to get along with everyone, her love of trivial things and frivolities getting her in with the girls, and her adorable gentleness and balletic movements causing her to come off as endearing to boys and adults. Unfortunately, her father breathed his last because of a sickness when she was 10, but he passed away in his sleep so the twins were allowed a small amount of comfort that his passing had been a peaceful one. Rather than staying with their Aunt Clio, they followed the strict orders they received from their father while he was in the hospital, to venture, instead, to a place named Camp Half-Blood. And so it began. Weapons- An ebony longbow, chosen because of her natural gift for archery and her preference to participate in the battle from afar. Abilities & Talents- Rina is a dancer, her movements are always graceful and never rough or abrupt. She does things in one fluid movement, rarely tripping or falling. Other- It should be noted that the twins are very close to each other. Appearance- Dot does look like her sister, but they make sure to have their appearances quite a bit different so people don't get confused. She stands at the exact height of 5'6", her slim body has more subtle, softer curves than her twin's. Her skin is lightly tanned and cheeks are rosy. Her dark brown hair comes to a stop a few inches below her waist and curls at the ends but is straight for the most part. Her side swept bangs are light and feathery and are regularly getting in her way but she can't bring herself to grow them out, although she does pin them up half the time. Her wary mint green eyes are flecked with silver specks and seem to penetrate a person's tough outer shell and expose their innermost and darkest secrets. Some try to avoid her gaze, but her eyes lock onto a target as soon as they spot one and she looks you straight in the eye - gaze unwavering and challenging. A few similar features she shares with her twin are their facial structures (cheekbones that are simply to die for), their delicate and thin wrists - inherited from their grandmother, as well as their slanted, almond eyes. As for birthmarks and scars, they have nothing of the sort, though it should be noted that Dot has much more scars than her sister has. These scars include slight burns around her left hip from a few third degree burns which took what felt like forever to heal, a fresh-looking pale pink slash a few inches above her right knee, and two more matching slashes on her left shoulder and right hip. All of her other scars are much less eye-catching. Dot also has a tiny blue lily tattoo on her right shoulder. Personality- Dot is definitely more confident and dependable than her sister, very much so, in fact. She sticks to her commitments and promises, never breaking them or giving up. Partial to loyalty, courage, honour, and all that type of honest stuff, Dot is an extremely moral person with a good sense of right and wrong. Accepting of her place and her responsibilities, Dot is the first to deal with things and she abhors just sitting around, waiting for things to happen to her. She likes taking initiative, she likes being the one in control. After all, who was better at controlling things than she? Prudent and on guard at all times, Dot's life summed up in one phrase would be "Better safe than sorry." While she will take risks when it is needed of her, Dot prefers not to. Finding happiness in stability and safety, Dot almost never moves around and she enjoys settling down in one place. She loves routine and is a creature of habit, having specific rituals she performs for specific things. She orders the same thing every time she goes to a certain restaurant, she always eats the same meal on certain days, she always does the most expected and typical thing of her. That's just how she is. Dot is practically bursting with energy and faith in herself, but she's lacking in faith for others. Indifferent and emotionless to others for the most part, she's more of a loner unless things require to be done by both her sister and herself. Dot doesn't mind things as long as she's by her twin's side when she's doing them. Otherwise, she's unenthusiastic about most things. Stubborn and spiteful, Dot is quick to judge those who do her wrong, seldom giving out second chances to those who have proven that they are unworthy of them. She's pretty harsh about things like that - in fact, she's harsh about most things. Although a person whose conscience often speaks against her actions, Dot is selfish and has an small but still unhealthy amount of malice in her heart. Complacent and almost cruel at times, Dot's cold and calculating way of dealing with things differs greatly from her sister's heart-over-mind system. She's the realistic one of the two, she realizes threats and deals with them to protect her twin from unsatisfactory fates. Dot is also prone to envy, something which inconveniences her immensely. Contrary to popular belief, and while she is almost unnaturally serious for a teenager, she does have a sense of humour. It's a little dark, but humour, nonetheless. While her personality is... most confusing, she has a talent for making things dramatic and she can make things into the greatest and most epic of all fables. And in reality, she is a nice person with really kind intents, but she doesn't come across as it. History-Dot has always been the one who had to take care of her sister. Even though she was only a few seconds older, she was always the one who had so many expectations to fill. Dot had to be reliable, she had to get not only good, but the best grades, she had to treat her sibling right, and she had to be a role model. Not just any type of role model, the perfect role model. Naturally, she did what she could, because what else would she do? And it worked. Rina was always looking up to her sister with adoring eyes and she was always bragging affectionately about her perfect twin. Dot was more than happy to keep everything up, and her sister wouldn't necessarily be in her shadow. No, definitely not, Rina was never in the shadows. She was always silently taking care of her sister and her father, she was the guardian of the family. There was no doubt that she was the strongest, and she was the realist. Only she knew what types of filth were out there, just waiting to stumble across a lovely girl like Rina and take her away from Dot forever. Nope, it simply wouldn't do. Her father and sister were the ones who bonded the most, and that had been fine with Dot. She was more than happy to watch as they laughed together. Unfortunately, her father breathed his last because of a sickness when she was 10, but he passed away in his sleep so the twins were allowed a small amount of comfort that his passing had been a peaceful one. 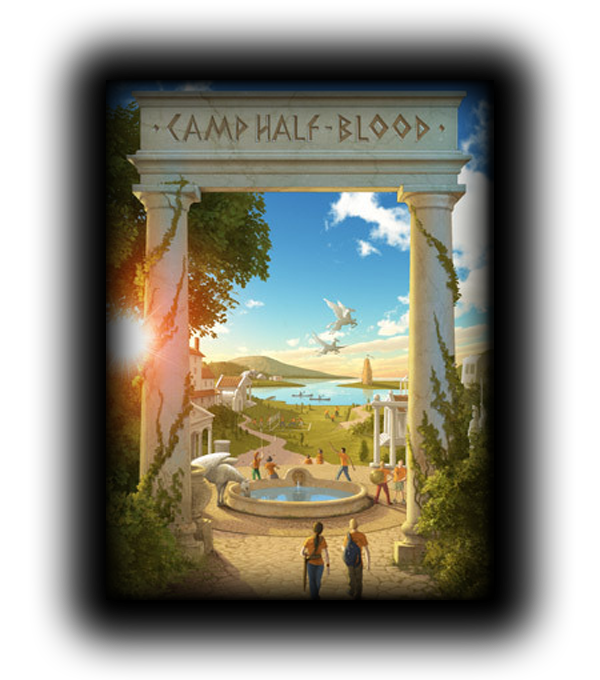 Rather than staying with their Aunt Clio, they followed the strict orders they received from their father while he was in the hospital, to venture, instead, to a place named Camp Half-Blood. And so it began. Weapons- A sword and shield, a simple combination she found that she was quite skilled with. They're always on her person, the shield being a steel, armoured wristband with a variety of buttons which expands into the shield when the buttons are pressed in the correct order and the sword being the bracelet on her other wrist - you have to press the seemingly harmless and pretty pendant. Abilities & Talents- She has an incredible talents in singing and story telling, the clipped and terse way she usually speaks doing no justice to her silvery voice. The fine web of words she spins every time she tells a story is nearly impossible to escape from once you've become trapped. She will change her voice around to fit the story, fully animating the characters and bringing the story to life with eerie voices, expressive hand gestures, little figurines, anything she feels that she needs to tell the story properly. You wanna start a roleplay? x3 Your twins and Benny? Appearance- Ace is 6'3" and quite muscly (though he was quite scrawny when he got to camp, those few years took care of him). He has jet black hair which is cut short and doesn't bother him, lightly tanned skin, and gunmetal grey eyes. On his arm is a smaller black tattoo of a complex design. He usually wears pretty casual clothes and he's pretty relaxed about (or you could say uninterested in) fashion. Looking a bit tough and a bit too willing to beat people up, ladies don't exactly swarm to him. And he's totally cool with that, getting some ladies isn't on his list of priorities anyways. Personality- Ace Ashfield is not the most social or friendly person in Camp Half-Blood, that's for sure. He can be quite cold and sarcastic, and a bit too impulsive for his own good, though he may blame that on the ADHD. Hostile and sardonic towards others, Ace doesn't exactly have oodles of friends. He's rather organized and intelligent, but slightly obsessive when it comes to organization, though he isn't aware of this. When things don't go according to his plans he'll wonder what he did wrong and doubt himself for some time before he starts to believe in his own work again. After being teased (or anything of that sort) he's often be more insulting and his vocabulary will expand quite a bit - with defamation. Peace and quiet is something that Ace greatly enjoys and he will muster his greatest death-glare for anyone who dares interrupt it. His very best death glare. And he's a son of Hades. Do the math. If you haven't already guessed, he's more of a loner and he's really independent. The only thing Ace has ever been a real natural at is killing, guess it comes from being son of the God of the Underworld. Sports aren't really his cup of tea, and he's never been an artistic soul, though something he is very much of is a creature of habit. Ace is also brave, courageous, and pretty much fearless. Even though most demigods are rebellious, Ace prefers to stick by the rules and he rarely breaks them unless he deems it absolutely necessary - nothing less. He can be quite rude and mean as well, depends on his mood really. Pleasant one moment, ripping out your throat the next. Ace's emotions are not something to be played with. Also, peer pressure will not work on him, he has an insanely good sense of right and wrong, and he prefers not to listen to other people and to just listen to himself. He really hates it when people try to force him to do anything and when he gets mad he does numerous things. Blunt and almost painfully straightforward, Ace doesn't care much about who he hurts and figures that they should be strong enough to handle it. They are, after all, a demigod. He's not much of a people person. He's not anti-social, exactly, he just doesn't approach people very often. He can be pretty nice at times, but half the time he's as moody as a girl - and his wrath is half as fiery as one's, too. Fatal Flaw- He holds grudges and finds it incredibly hard to forgive others. Traitors do not deserve a second look in Ace's opinion. He's a bit harsh when it comes to such things. Actually, he's a bit harsh when it comes to anything. History- Ace had a pretty normal past, not really having very many important events in his life. The monsters attacking him left and right doesn't really count. It's a given for demigods. But there is this one juicy little detail. Ace was - and he always winces whenever he thinks/says this - a little more than a bit of a geek as a kid (and he still is, once a geek, always a geek). He also, once had a different name. "It's an appropriate and adorable name!" His mother claimed when he asked her why she named him such an embarrassing thing. He changed his name to Ace when he was 15 or so, just before he entered Camp Half-Blood. Weapons- A stygian iron sword named Afterglow, the handle has a crystal of darker colour embedded into it and only when it catches light during twilight does it shimmer with different hues. Abilities & Talents- Ace has a minor degree of necromancy skills, skills he doesn't bother honing due to the fact that he's never been a mage-class-type person. Rather than necromancy, he has excellent swordsmanship - but he hasn't fully tapped into the greatness of it just yet. Other- Ace is often seen taking a nap in various places around camp after training because using his Hades powers really tires him out. Appearance- Alyn stands at the height of 5'7" and her slender body is toned from hours of working outside and helping her father around the ranch. Pale skin which she piles sunscreen on whenever she's outside for long periods of time, Alyn is quite paranoid about her own and others' health which is why she's quite specific about protecting her skin from the sun's harmful rays. Auburn hair coming to a stop around her hips and wavy for the most part, Alyn's hair has an attitude of its own which is complimented by the impertinent curves of her body. High cheekbones and slightly arched, expressive eyebrows. Relentless amber eyes always look at others in such a direct and straightforward way it's almost awkward. Alyn's often wearing casual clothing, just some jeans and a camp shirt as well as some boots, maybe a few accessories but Alyn isn't very concerned with her appearance. Personality- A person who greatly values honestly and being true to yourself, Alyn practises what she preaches and has a high self-esteem as a result. A confident and bold individual, Alyn is out-spoken and she isn't afraid in the least to add voice to her opinions. Her audacious and loud tendencies cause her to be an interesting person to have a conversation with, never a dull moment in a conversation with Alyn- unless she's distracted or worried. Her enthusiasm never seems to ebb, even when she's tired, but then again, she never seems to get tired. Unpredictable and fierce, she's more of a "tough love" person, but she is capable of loving others. She also has a firm belief in natural beauty and that if you put an earnest effort into everything you do, it doesn't matter whether you have dismal outcomes. She never seems to give up and she will see everything she's started to their ends. But she's cynical and weary. She's been betrayed and broken too many times to trust others easily. Slightly distrusting when it comes to men and a bit of a misogynist, Alyn has a small dislike of both genders causing her to not enjoy socializing very much. She's extremely suspicious of people and their motives, causing others to get tired of her endless accusations. It's fine with her. She'll make friends but it's guaranteed that the friendship won't last. She won't make it last. Standoffish and aloof sometimes, she tends to make others feel more unintelligent when speaking to her - something that always drives them away. Stubborn, conceited, and a bit infuriatingly clueless at times. She allows imperfection and is usually a really silly person, she finds it hard to take things seriously and overall, she's capable of annoying people quite a bit. Brave, courageous, strong, loyal, and hard-working, Alyn has a great deal of morals - morals she will often teach to others as her father taught her. But even though she has a strong sense of right and wrong herself, she's quite willing to learn more about what is correct and proper. She loves learning, although at times she is impatient and just wants the lessons to end. Immature and unfocused most of the time, it's quite hard to teach her things because of her child-like manner. But she believes that she's turning into an old woman a little too quickly, so Alyn, occasionally, worries that no man will ever want her. Of course, she doesn't let this tiny little thought dominate her entire being but it's always there, in the back of her head, forgotten at times but well-remembered for the most part. Fatal Flaw- Hesitation when it comes to killing anything or when dishing out consequences/punishments. History- Raised by her father on the ranch, Alyn had a happy childhood - home schooled by Tyrell himself and taught extra lessons like morals and the significance of things like love and their importance over material, trivial things like money and possessions. Alyn tried her best to behave herself, but at times she caved into the desire and did some silly things, but she tried her best to fix them after wards. She'd always had a love of plants and she learned valuable things like responsibility and duty while performing chores and assisting her dad around the ranch. Tyrell was - and still is - a great father, one who is fun and awesome but strict whenever his daughter got herself caught in a web that was a little too intricate and sticky for herself to get out of. They had, and always will, have a great relationship - one which is probably envied by those with more unsatisfactory relationships with their parents. Alyn is well-aware of the fact that she's lucky, although Tyrell never told her (he's much to modest for such things), she figured it out herself. When she, reluctantly, left him for camp, they were both extremely sad. It's been almost two years since they last saw each other and they miss each other terribly, but what can they do? Behold, the miserable life of a demigod and their beloved mortal parent. Weapons- A delicate looking but strong silver longbow which has an extremely green vine and leaf pattern. Abilities & Talents- Chlorokinesis and a talented cook, she has the typical Demeter talents. Other- She talks with an accent. Soo... put into [official] words -- pending. She's not over the max, silly. The max for Bacon is 4. Edit #2: ALYN, YOU BORE ME.